Readers, please pardon this personal post. This Valentine’s Day I went to bed with a truly warmed heart. When I took Clara to the vet earlier that day, I thought we were going to be treating hairballs. She was throwing up and had a little diarrhea. I did not expect the next few hours to unfold as they did. Her wonderful Doctor Dan showed me her xray, explaining her intestines were not in the right place, loosely filling the abdominal area. Instead, they were all balled up in one area, sound together with some areas swollen with gas. He explained what we were seeing often means an eaten thread* caused the intestines to draw up on themselves. Knowing just how much thread and other fibers are in the house, hit me in the gut. After calling Dan to let him know and a few tears with Clara humming Grandpa’s song, her calming, sweet nurse, who’s name I can’t remember, took her back to immediately prep for surgery. What happened next still has me in aww. The care for our Clara flooded in on FB and in my messages. Clara received gifts from a few people I have never met. I listed a few things I could find quickly on Etsy (the batwing bonnet, my bandeau, lace, gloves, some sewing things.) They were all gone overnight. My shop was empty and my heart full. By the time I was able to pick her up, I had just the right amount to cover her surgery bill. It was such a blessed feeling to be able to say “yes” and be able to giver Clara what she needs. We want to give a heartfelt thank you to those who helped these last few days, either financially or emotionally. I appreciate you more than I can say. As we were leaving, I had the most humbling moment. I think I opened the door with a squee of “home!” I began to walk by a woman was standing at the counter with a toweled bundle wrapped in her arms. She had tears running down her face. My heart caught in my throat. I turned around and hugged her. This was such a heart breaking reminder that this could have easily gone the other way. If we hadn’t called the vet and brought her in, if it hadn’t been caught, if we couldn’t do the surgery. Oh, how I felt for that woman and her toweled bundle. Now, as you’ve been reading and waiting. How is Clara? Clara is home now. She is recovering with lots of sleeping and snuggling. She is eating little bits of baby food. This will be her diet for a few days after which we will add in soft canned food. We are going to keep her on a higher moisture diet. (she had been eating dry food in the mornings, wet in the evenings.) We will be going back today to get her IV catheter out. It stayed just in case. There wasn’t anything in her intestines – no string, no wool. Her intestines and omentum were balled/wound up in a ball up in one section of her abdomen. They should be loose, filling her whole abdominal area. The doctor does not know why this happened. Gummy, stickiness is usually from dehydration. She was not dehydrated. So, Clara has yet another mystery. Clara is resting and sleeping a lot, as she should for her recovery. Last night she did not leave me at all. She was okay with being next to me, but preferred to be on my shoulder, chest, or neck. I don’t think she likes that I am getting ready for work. I’ll be putting her cone on just in case. This mini-project is all about timing. I saw this antique pin cushion ball the same day Clara started tummy issues. So, this sewing ball became a cat toy for sick Clara. I love the looks of the original. 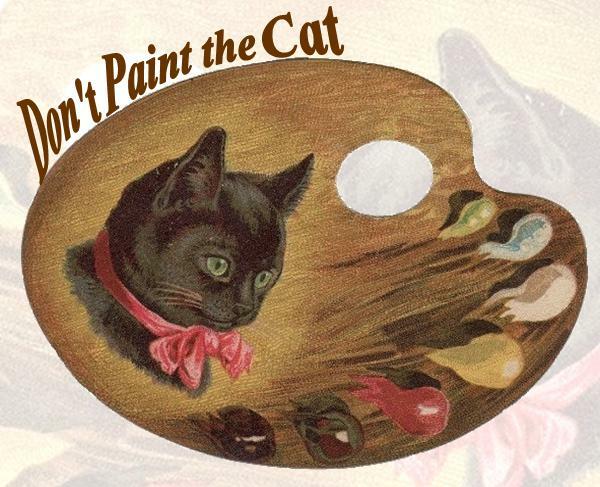 I estimate it is a late nineteenth to early twentieth century creation. It captivated my thoughts, wondering how the maker got such beautiful lines and smooth ball. To get the nice smoothness, I suspect there is a lining layer under the silk, something much firmer than the silk itself. This is what is making the silk smooth. 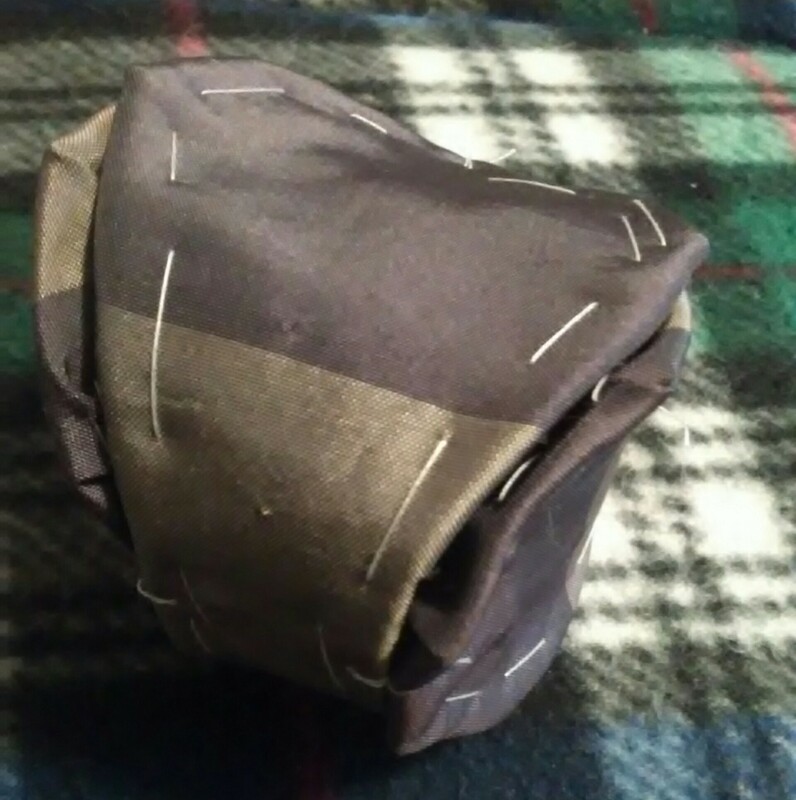 I would like to see if the two silk pieces are sewn together from the inside with a running stitch or a whip stitch on a folded edge, or on the outside using a small herringbone stitch. I wanted a fuller body than what the silk can provide. So, I decided to make a felt base. 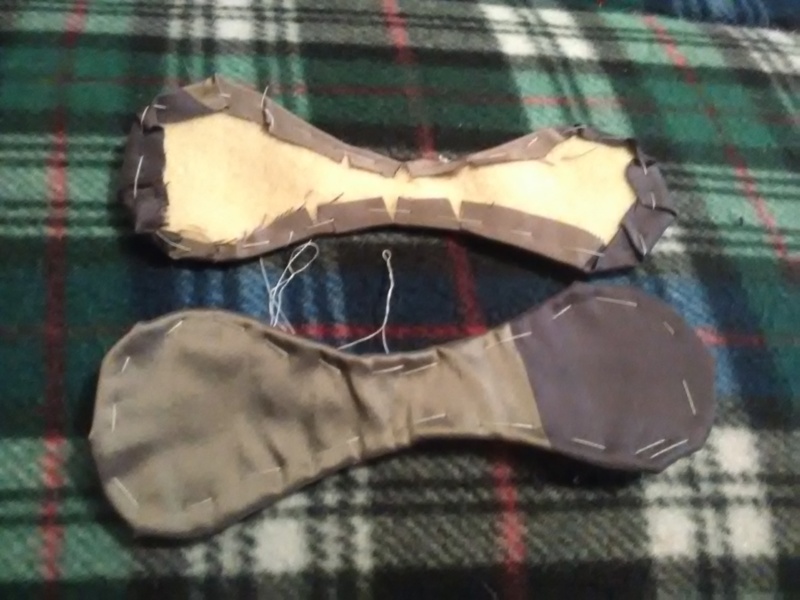 I cut two felt bases without a seam allowance and two silk pieces with a seam allowance. I basted the silk over the felt, sorta like paper piecing. What I learned here is while this is okay for a cat toy, this does not give a sleek line like the original. 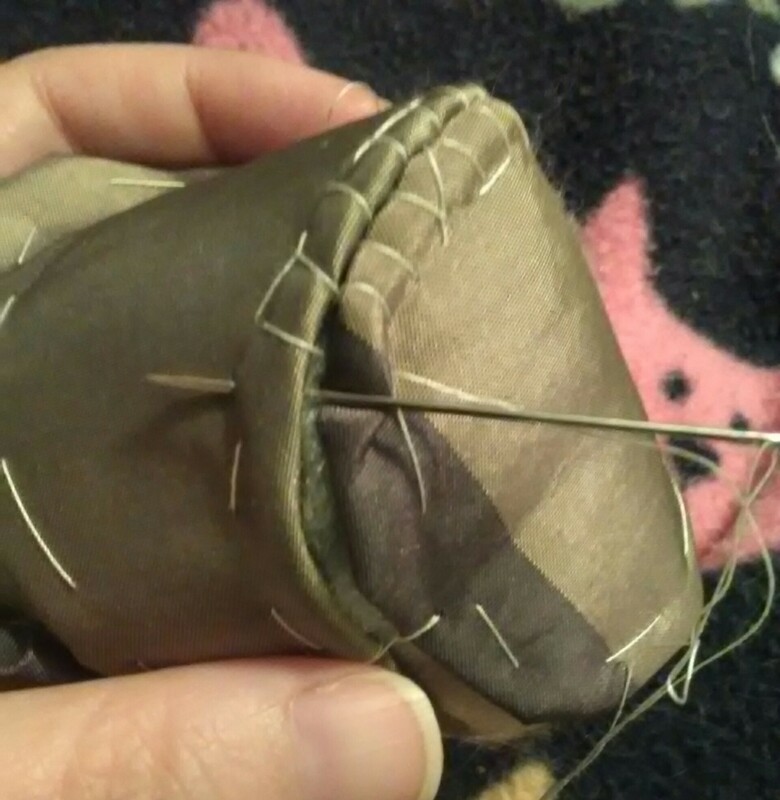 The lining needs to be much thinner, firmer, and smoother. The edges also need to be pressed. There was no pressing in this quick project mode. 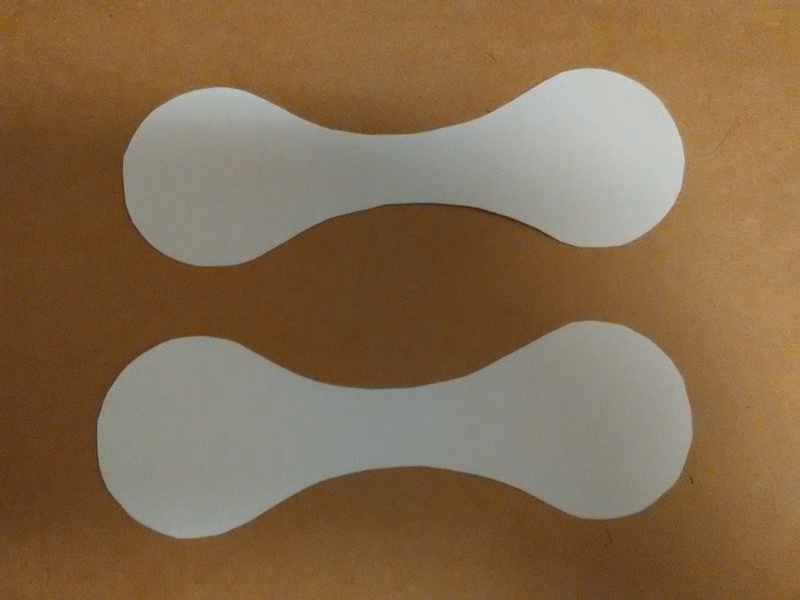 I found it a huge help to start by tacking each circle center to each “bone” center. This made sewing much easier. This is the stage where I stuffed the inside with batting and catnip. It needed to be stuffed firm enough to have the batting pushing the edges out. For Clara’s ball, I found the herringbone stitch was essential. Drawing the thread between the pieces kept the pieces from overlapping each other. After the whole thing was sewn together, the basteing stitches came out. Knowing how Clara can play, this does not get decorative stitches. The ball is not only Clara approved, it is sick Clara approved. For a while we rolled it back and forth on the floor while she laid stretched out. or, Starry Night over Fallen Snow. I am so excited to share with you my three year spanning project. Finally! Fallen Snow on a Starry Night uses early nineteenth century sewn rug techniques with a play on Vincent van Gogh’s Starry Night. Each area of the rug is created with folded strips or gathered “chenille” wool, sewn to a linen base. This rug has three whites, six blues, and two greens. 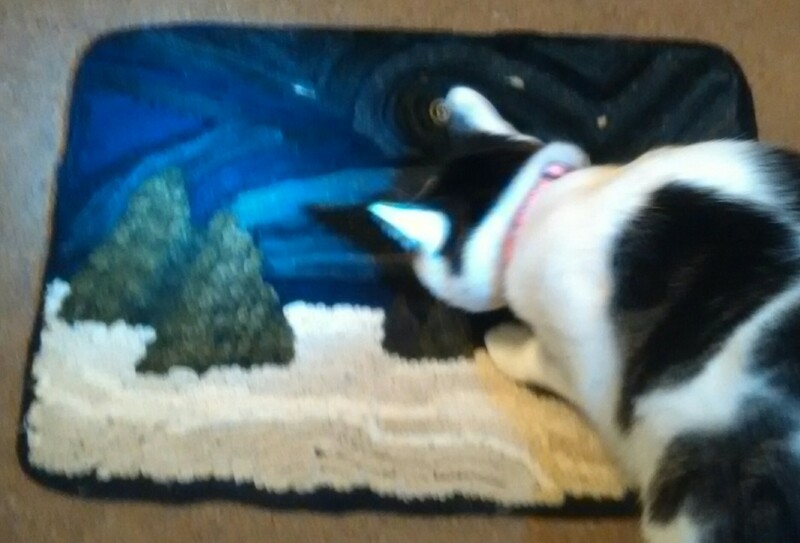 To my delight after finishing it, I found the rug changes in different light. Here are some of the progress photos. Btw, this project is Clara approved.